← High Impact Area? No problem with Trim-Tex Mud Set. 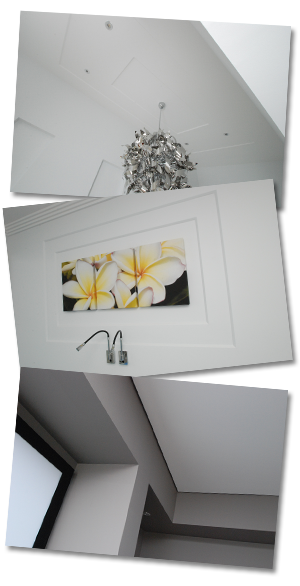 Plasterboard features don’t have to be complicated works of art that belong in the Louvre. Some of the most eye catching feature work has a simplistic beauty about it. Eternal Plastering recently completed a home on Queensland’s, Gold Coast. It’s a standout example of how simple plasterboard layers can become design features. The home owners were after something ‘unique’. Ray Leef with some help from Trim-Tex, was able to deliver stylish plasterboard finishes and features to complement the modern design of the home. Ray started using Chamfer around the lighting in the entry, he told us he was amazed at how creative he could be with it. He then went on to design and created the “frames” around owners artwork which double as bed heads. The Chamfer features were made from Trim-Tex Chamfer Stop and 13mm plasterboard. Not only does the Chamfer Stop maintain the appearance of a crisp corner – but it also complements the 4-Step cornice around the ceiling. Tear Away Shadow Bead was installed around the perimeter of the ceilings as well as door and window jams creating an attractive shadowed “reveal” effect. The combination of the reveal and strong, bold paint colours draws in the eye and makes a powerful statement. It continues the modern look with a point of difference all for a relatively small amount of additional labour and cost. Trim-Tex Chamfer is available as a corner bead, archway bead and stopping bead so you can continue the sharp look throughout your entire project. Tear Away Shadow Bead comes in 10x10mm and 6x10mm sizes adding interest to plain ceilings, windows, doors and more. These beads are just two examples of trims that offer an alternative to plain 900 corners and long, boring expanses of plasterboard. This entry was posted in Feature Story, General and tagged Australia, Chamfer, Shadow Bead, Tear Away, Trim-Tex, Wallboard Tools. Bookmark the permalink.